Main Stream of Northeast Creek: Where Does Your Water Go? Creek Week is coming March 16 through 24. 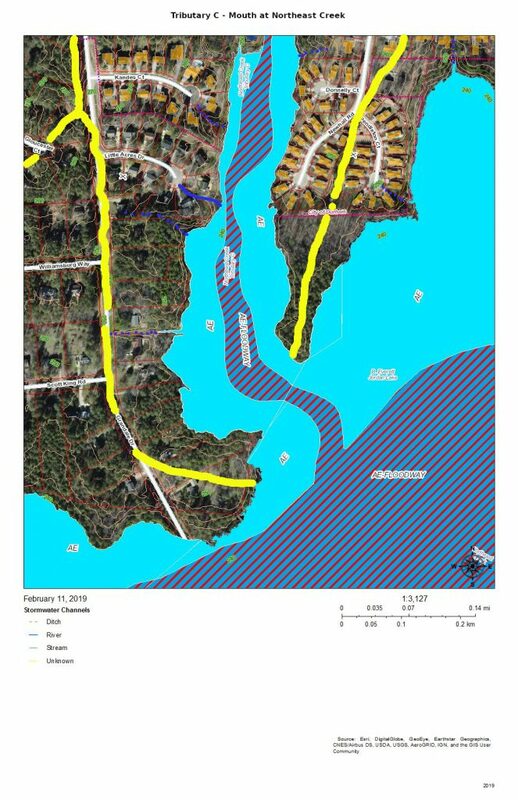 During that week Durham is focusing attention on how individual citizens and property owners can with modest efforts deliver significant benefits to the quality of water moving downstream, especially to Jordan Lake. 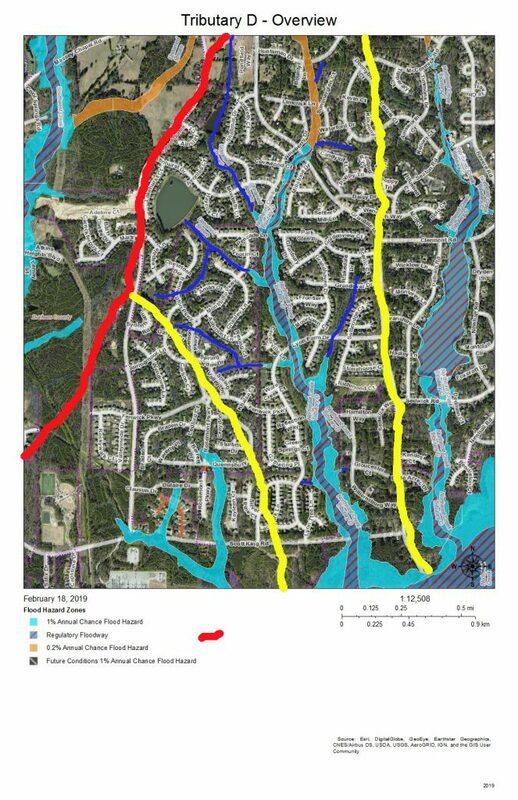 A fun activity during Creek Week is to find the path that water from your roof, sidewalk, driveway, and patio or deck takes as it goes to Northeast Creek, down Northeast Creek and into Jordan Lake, and down the Cape Fear River to Wilmington. To do that, we must perceive streams and their tributary flows of runoff (the water) in the foreground and land in the background. Focusing on the flash flood zones at full flood (the flood zones identified on the maps) shows the land as necks extending into the fully flooded lake headwaters. 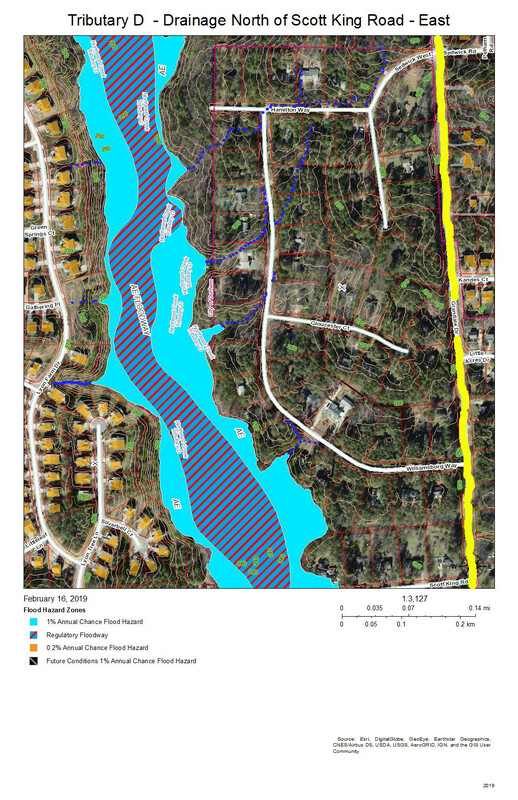 After all, one of the primary purposes of Lake Jordan was mitigation of the flash flooding that often occurred in the Haw River and New Hope Creek basins. Black with gray diagonal stripes: Future conditions 1% annual chance flood hazard. These organize themselves to best handle the flow of water through the wetlands in wet and dry periods. On the maps, wetland features are marked with dotted blue and or‍ange lines. Tributary D draining the western part of the McCormick high land and streams from Hunters Woods joining and running down Wineberry to the west. 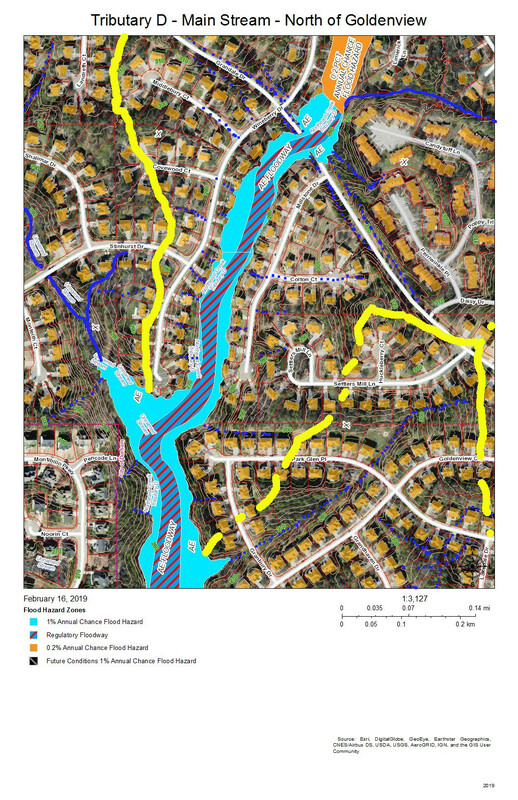 This post presents maps to help find the path that the water takes from the roof of a particular house to the main stream of Northeast Creek and the features of the Northeast Creek wetlands that it passes through. Future posts will look at what you can do on your own property to help preserve effective functioning of Northeast Creek. 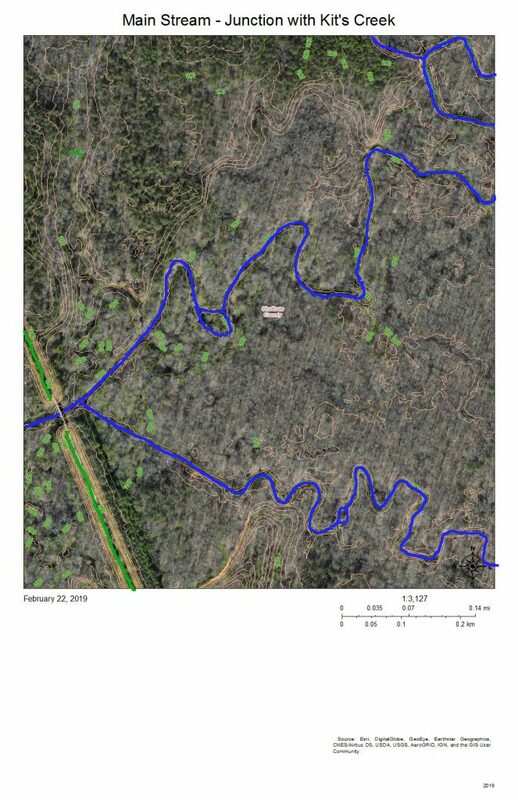 The following map is an overview of the Northeast Creek main stream from Carpenter-Fletcher Road downstream to the American Tobacco Trail bridge over Northeast Creek on the trail a half mile south of the Scott King Road trailhead. The red line is the watershed ridge on the west between the Northeast Creek basin and the Crooked Creek basin. Another branch of Kit’s Creek, which drains the southern section of Research Triangle Park. Main stream of Northeast Creek. it flows under the bridge for the American Tobacco Trail, a bicycle and pedestrian trail. There are two stream gages placed by the US Geological Service on this section of Northeast Creek, one at Carpenter-Fletcher Road and the other at the bridge on Grandale Road. 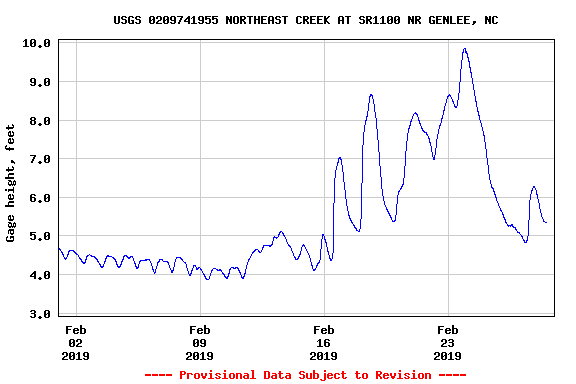 To provide a view of what this section of the main stream does, here is the February 2019 stream gage data for the Carpenter-Fletcher Road gage. Notice that the level during moderate periods is around 0.5 feet (6 inches), but rain quickly causes the level to rise to 2, the 2.5, then 4.5 feet. Remember these numbers when we come to the data from Grandale Bridge. That stream gage is just upstream (north) on the North Prong (out of view off the top of this map). The North Prong drains the Northeast Creek watershed south of Riddle Road and southwest of the intersection of Riddle Road and Alston Avenue. When it enters Meridian Park it flows into a wetland between NC 55 and Meridian Parkway (top right on the map). I-40 appears at the top right of this map. 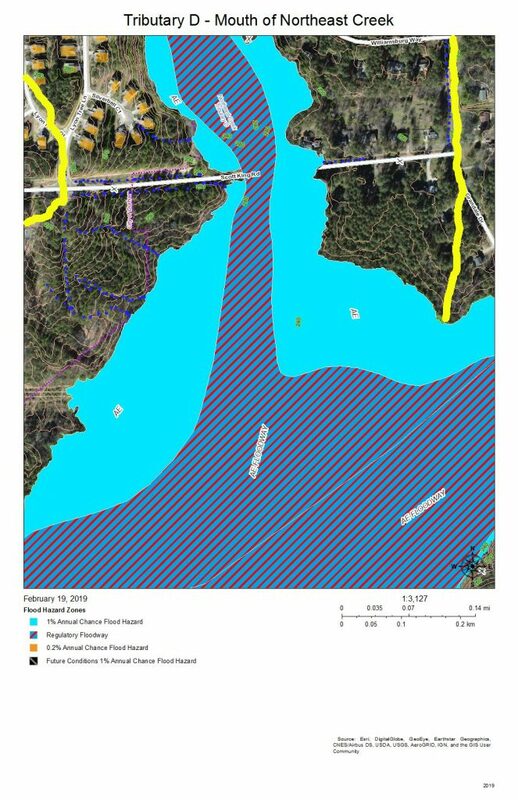 The dotted blue line on I-40 is roughly where the culvert for Northeast Creek goes under I-40 and spills into the flood plain to the south. At the left end of NC 54 on the map is Christus Victor Lutheran Church; at the right end is Chik-Fil-A. The bridge is where the wetlands on the north side of NC 54 spill through to the south side of NC 54. This area regularly has high water during rainy spells. Almost all of this wetland area except for the various stream channels is a wide intermittent flooded area during rainy spells. Drier weather allows for plant succession until water collects so frequently in those areas that it drowns out vegetation or gets replaced with water plants. 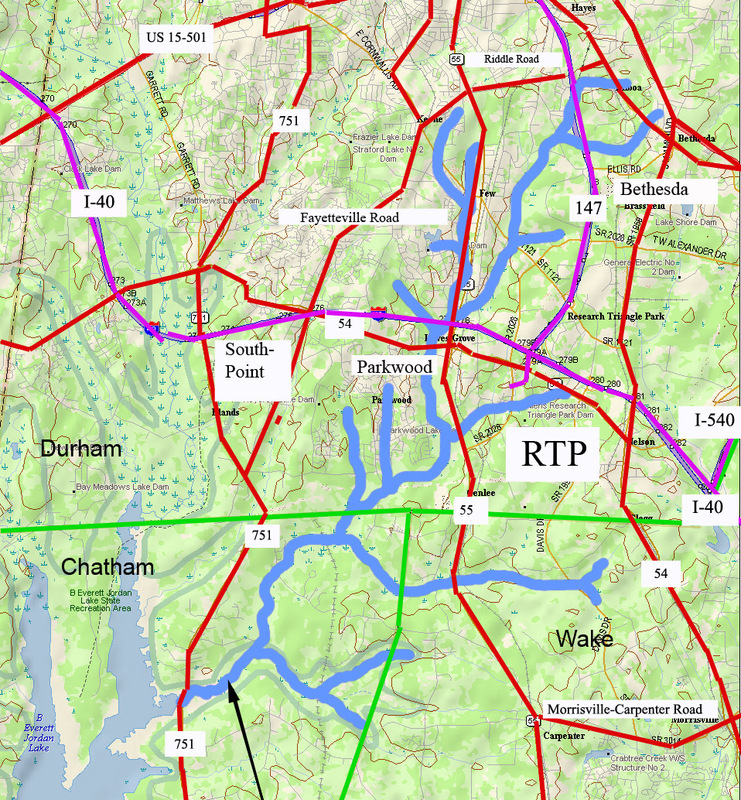 The drainage of the sub-basin north of NC 54 gets directed parallel and south of I-40 and flows into the wetlands south of I-40 and north of NC 54 (in the previous map). The sub-basin on the top right has a stream that flows from the intersection of Blanchard Road and NC 54 southeast into the engineered pond behind the commercial buildings on NC 54. The third sub-basin flows out of the pond at the Revere Road end of Euclid Drive, between the houses on Lattimore Lane and Euclid Road, under Euclid Drive at the bottom of the hill, and down an restored stream that replaced a culvert and into the main stream of Northeast Creek in the wetlands. The sub-basin at the top shows the drainage into the creek that flows from the pond at the Revere Road end of Euclid Drive and the creek that crosses Euclid Drive along the road to the former package sewer plant location (when Parkwood contracted its own private water and sewer service). 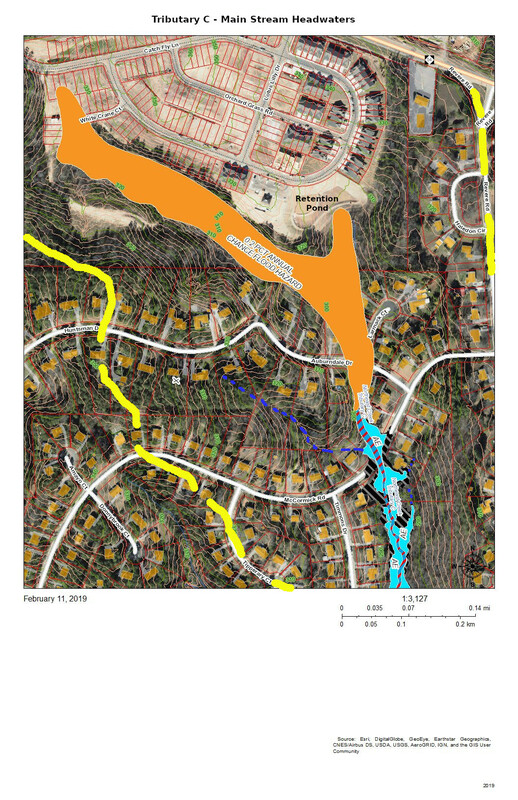 The sub-basin at the bottom left is the area on Brentwood Road that flows into Tributary C. The remaining sub-basin is the intermittent stream that drains Emerald Circle. 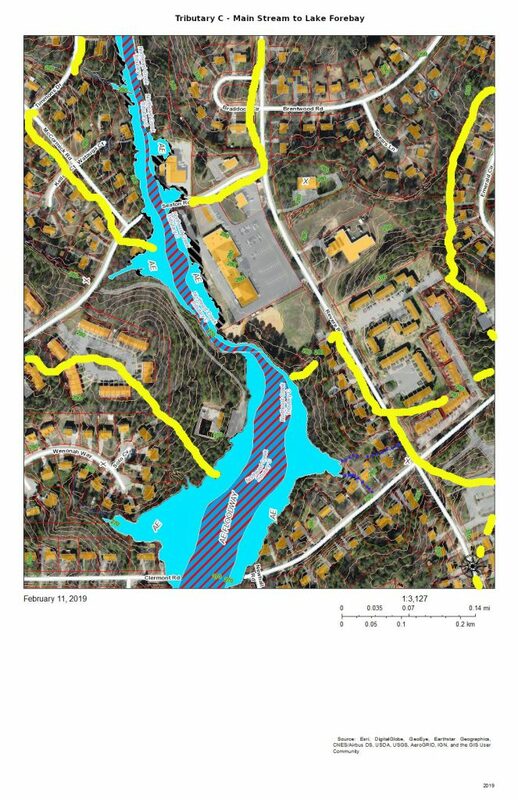 The complex pattern of blue lines (stream channels) on this map show the effects of a strongly meandering and braiding Northeast Creek and the engineered attempts to reduce flooding of the parking lots of the properties backing up on the wetlands. All of the water from the parking lots built on what used to be farmland adjacent to bottom land instead of somewhat soaking into pasture of woodlands, now all flows into the wetlands. Commercial property owners nationwide are only now beginning to investigate how to better manage stormwater on commercial properties. Local governments have mandated certain best management practices for stormwater management over the last ten to twenty years. The most obvious of these to most customers are the retention ponds on the edge of commercial developments. The blue and orange dotted lines encircle areas of open water in the areas behind the commercial properties on NC 54 and the Food Lion shopping center on NC 55. The sub-basins to the left of the map drain into Tributary C (Parkwood Lake). Parkwood Elementary School has engineered stormwater management of its site. 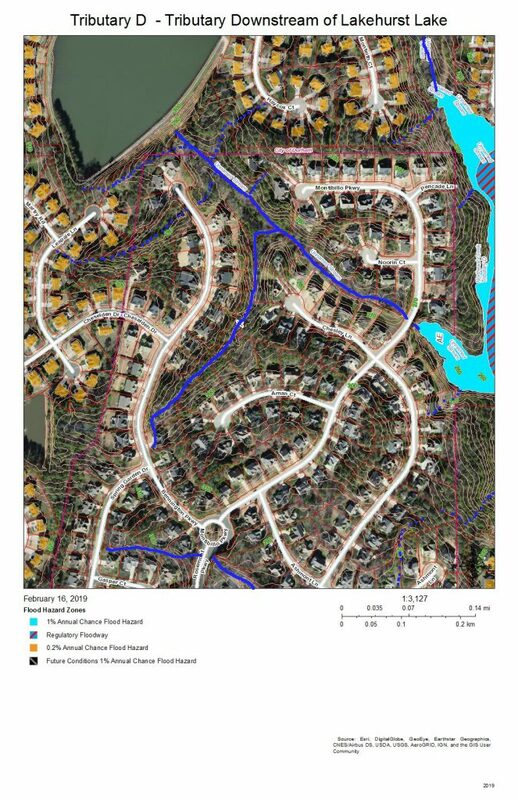 The houses on Radcliff Circle drain down the vegetated ground cover of the buried sewer outfall to the main sewer line that goes to Triangle Wastewater Treatment Plant on NC 55. As the intensity of commercial development on the eastern edge of the wetlands diminishes and as the force of flooding during rainstorms is absorbed by the size of the bottomlands, there are fewer engineered channels and the channels go from braided to parallel meanders. The blue lines show stream channels; the blue and orange dotted lines show the perimeter of the more permanent swampy and marshy areas toward the eastern edge. At the bottom of the map behind Greenwood Commons, the eastern side is a cattail marsh with a few snags. This marsh has been flooded by a natural dam of crushed branches and cattail stems that elevates the water impounded slightly above the western branch, which has a series of meanders. The two branches join shortly before the main stream passes under the bridge on Sedwick Road. The primary drainage between the heights at the Parkwood Elementary School building and the short ridge on which Frenchman’s Creek Drive is built is the grassed sewer line easement (solid blue line) that runs from Radcliff Circle back to the main sewer outfall easement in the wetlands; both of these easement are somewhat wet from unevaporated stormwater except in very dry periods because of the intermittent streams (dotted blue lines) and groundwater flows that allow what rainwater that does soak in to be delayed in adding to the stream flow. 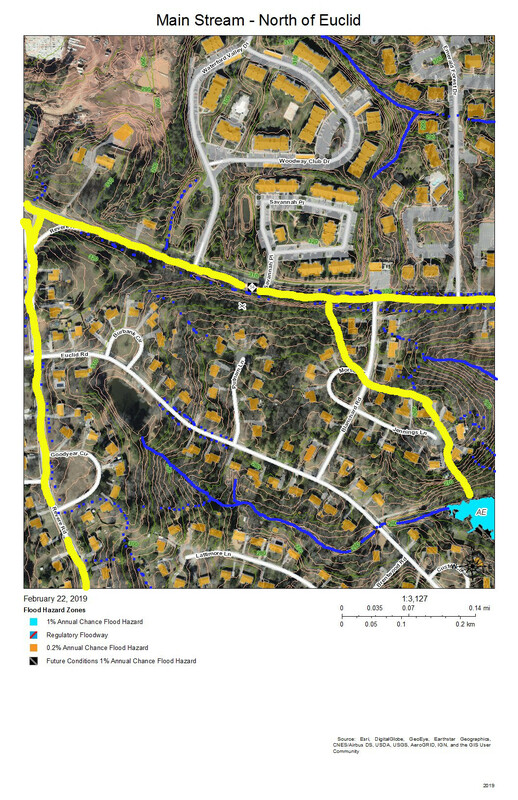 Water runs off the impervious surfaces, such as roofs (orange), driveways (gray), and streets (white). The runoff that comes through the dark green forested area that have a lot of leaf litter moves much slower. The water that does percolate through into groundwater move slower still. This area shows how the undisturbed common land buffer on the steeper upland slopes between the individual house property and the wetlands carries out those functions. To the west, the meandering stream channels of the west branch of the main stream of Northeast Creek running just east of the sewer line easement that runs to the Triangle Wastewater Treatment Plant. 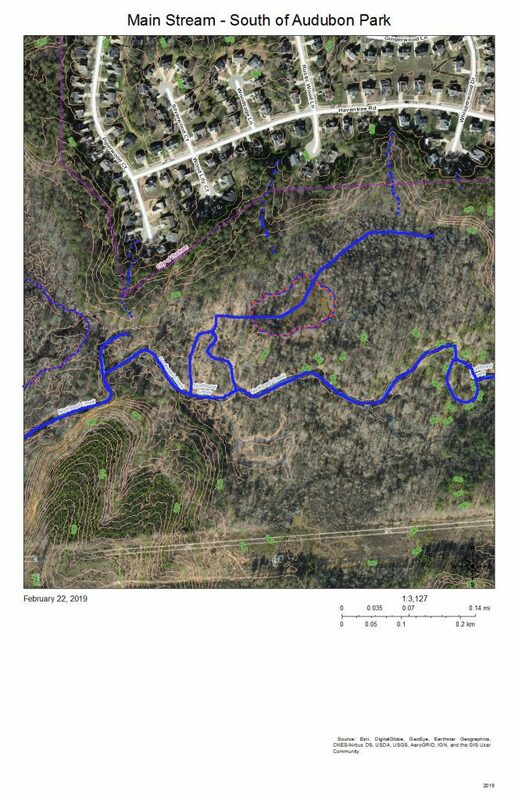 Coming in from the southwest, the tributary stream that has formed from the accumulated groundwater and runoff flowing from the heights of Parkwood Elementary School, Radcliff Circle, and Frenchman’s Creek Drive. From the marsh behind Greenwood Commons, the stream channel that has flowed nearest the commercial properties on NC 55. The single channel of the main stream of Northeast Creek flowing under the Sedwick Road bridge. Burdens Creek and its wetlands joining Northeast Creek from the east. A north-flowing creek to the east of Solitude Way. An oxbow lake just southeast of the junction of Burdens Creek and Northeast Creek. 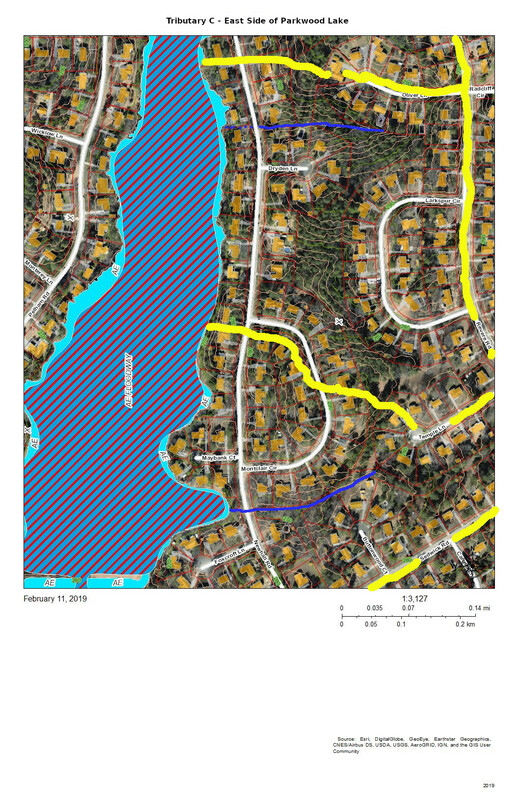 The blue and orange dotted line encircles an area that became a intermittent pond after the property was logged. The property is going through succession of vegetation and now is beginning to have small trees and forest sub-story beginning to grow. Several years ago there was a cattail marsh in this wet spot. You can also see some of the unmarked meanders, tributaries, and oxbow lakes as darker areas near the streams. Audubon Park was developed with intensive site preparation and most likely stormwater pipes and structures to conduct runoff quickly into the wetlands to the east and south. What appears on this map is a stream inside Piperwood Circle and Solitude Way. There are also indications from the topography that intermittent streams might form with the slope of the ground and run off at the edges of the wetlands; after almost 20 years, there might be gullying at the edge of the wetlands (near where the blue dotted lines meet the color coding of the flood zones). Homeowners in Audubon Park have the best view of how the water runs because so much of the drainage is enclosed interior to a bunch of houses and not visible by the public. The wetlands east of Audubon Park show the meanders and oxbow lakes of intermittent flooding of bottomland forest in the area where Burdens Creek, coming in from the northeast, meets the main stream of Northeast Creek, meandering in from the north and making a eastward turn. The Triangle Wastewater Treatment Plant is at the lower right. The main stream turns to the west around the southeast corner of Audubon Park. 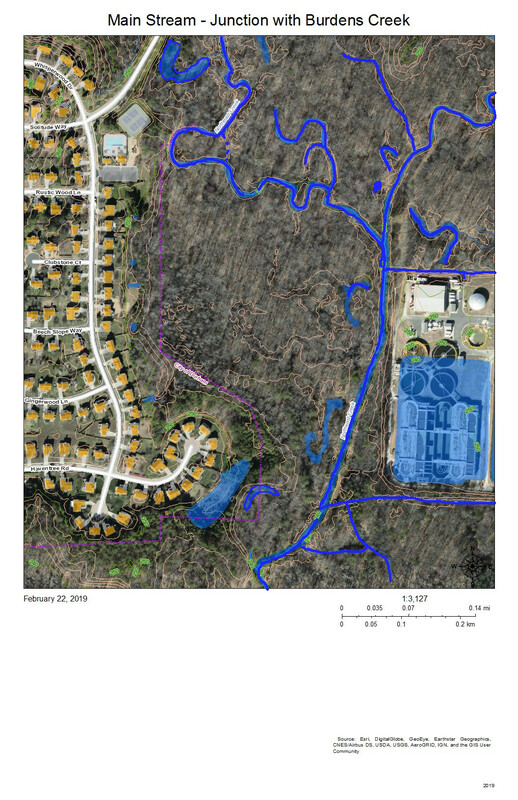 On the map, the development at top right is the back edge of the Triangle Wastewater Treatment Plant. The blue lines are the meanders and loops of the main stream of Northeast Creek and the tributary streams that drain other parts of the wetland. The area on the left marked with a blue and orange dotted line locates a former swamp forest, now characterized by snags and fallen trees killed by the persistent deeper water. 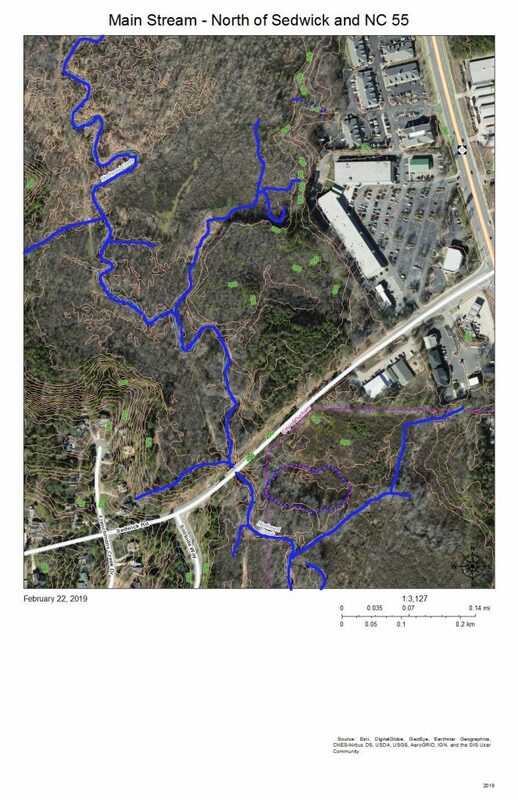 The two lines across the bottom are the high-voltage power line running from a substation on NC 55 to a substation on Scott King Road by the American Tobacco Trail. This section is where Corps of Engineers ownership of the headwaters of Jordan Lake begins on Northeast Creek. This view is slightly to the west of the previous view; the area of snags and fallen trees noted at the left of the previous view is in the center of this view. To the left of this view is another swamp forest in decline. 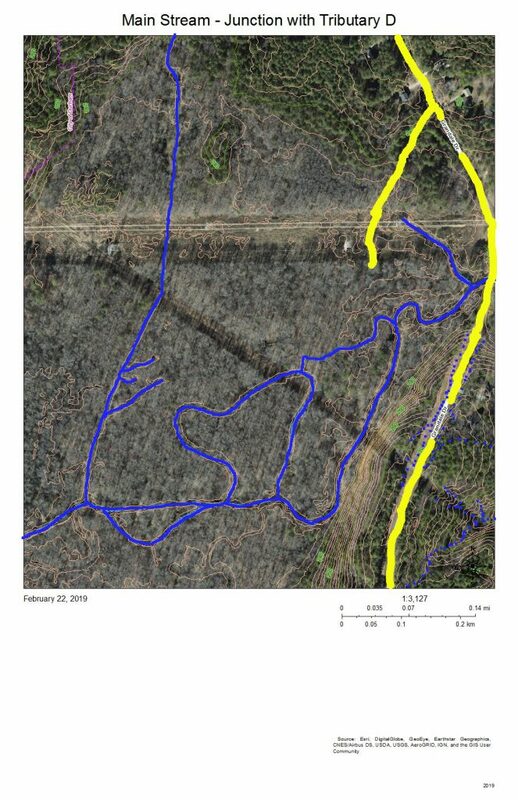 The yellow line is the headwaters ridge between the main stream of Northeast Creek and Tributary C of Northeast Creek. 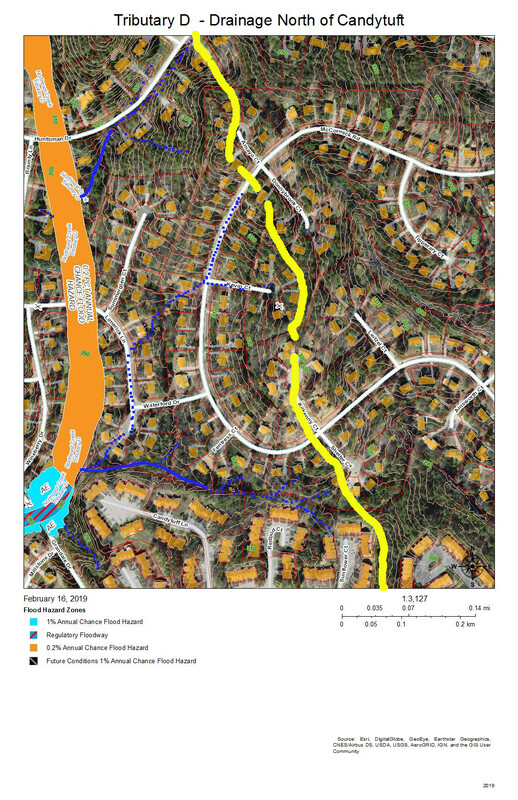 The solid blue lines are the more permanent streams, and the dotted blue lines are the intermittent streams that drain the streets off Newhall Extension in Parkwood. At the end of Shamrock Road is a triangular-shaped upland buffer of common land that faces out on a large freshwater marsh interrupted by some of the areas of flooded snags and fallen trees. 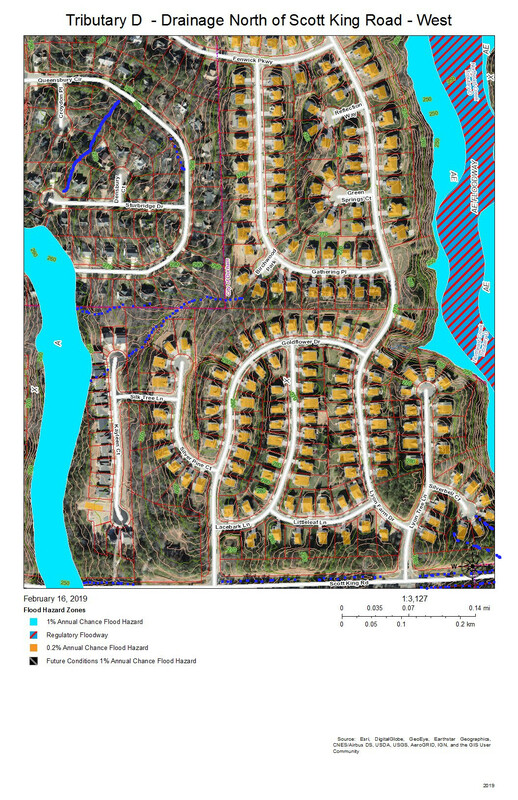 Notice that the buffers between the newer developments and the wetlands are much narrower. This is the same as the previous view but without the color coding for flood hazard areas. The yellow line is the watershed ridge between the sub-basin of the main stream and the sub-basin of Tributary C of Northeast Creek. The areas enclosed in blue and orange dotted lines are areas that are more permanently wet, such as snag areas, freshwater marshes, and open ponds. There is an area in the water at the end of Pendleton Court that is light green; this appears to be algae bloom. Beyond it is a dark area of open water, and then the speckled area of the freshwater marsh. Toward the bottom left is a dark open water area, enclosed with a blue and orange dashed line, in which fallen trees are clearly visible. Within the marsh are thin, short slashed lines that are the shadows of standing trees. The open water through the marsh shows meanders that might show areas of faster flow. On the bottom right is a 40-foot hill that forms a bluff at the southern edge of Northeast Creek. All of the ricocheting of water in this wetland slows it down and allows it to spread across the low areas and soak in as best it can in the Triassic and floodplain soils. The Grandale Road bridge is just south of where the high-voltage power lines cross Grandale Road. 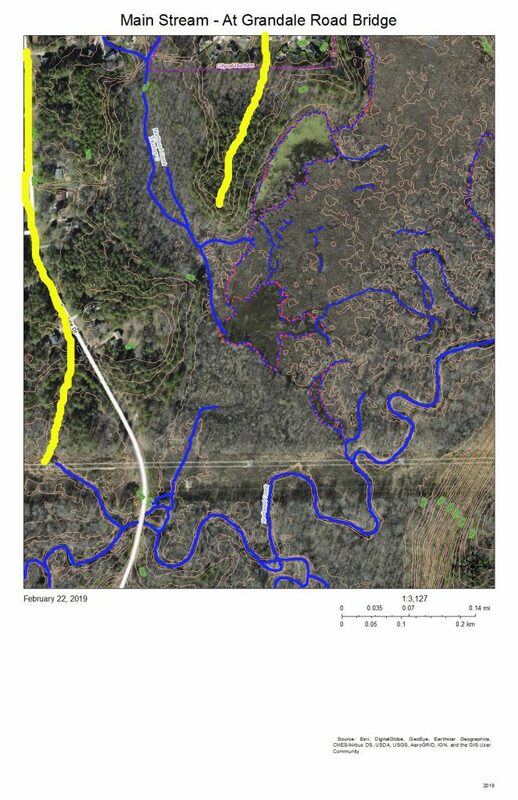 The yellow lines mark the headwater ridges that separate the sub-basins of, from east to west: the main stream, Tributary C, and Tributary D of Northeast Creek. The features of the wetland north of the power lines are those we have discussed above. This view shows more of the wetlands to the west and south. The 40-foot hill turns out to be a 60-foot ridge that edges the floodplain on the south. Almost all of the bottom land in this view is Corps of Engineers property marked as NC Gamelands. The USGS gage station is on the bridge. The following is the report from the month of February 2019. Notice the daily cycle for the first eleven days of February. That is the record of the daily release of the TWWP, just that between roughly 5.0 inches and 4.5 inches. Increased streamflow begins around February 12 and rises through multiple peaks to almost 10 feet before decreasing toward the end of the month, with one rainfall around February 28. Compare this pattern with the pattern upstream from the stream gage at Carpenter-Fletcher Road. The yellow lines separate Tributary C on the east, Tributary D on the west, and a short minor tributary of the main stream in the middle. The meanders and islands are the pattern that the main stream takes through this section in which it is receiving the flow from Tributary D, the long, more-or-less straight, stream on the left. The diagonal line is a natural gas pipeline easement. The green line at the bottom right is the Rails-to-Trails American Tobacco Trail (ATT) that runs from the Durham Bulls Athletic Park to the village of New Hill in Wake County. The gap is just to allow the bridge over the Northeast Creek to be visible. Kit’s Creek (Kitt’s Creek is also correct) flows from the southeast and joins the main stream of Northeast Creek right before the ATT bridge. This junction is in Chatham County. The area to the north of Northeast Creek is bottom land hardwood forest that includes some magnificent beech trees and shagbark hickories. This entire floodplain down to the rookery at the mouth by the NC 751 bridge is owned by the Corps of Engineers and administered by the NC Wildlife Commission as gameland. Another fun activity is to see where your water goes when it leaves the Parkwood area. A great way to explore this part of Northeast Creek is to hike or bike on the ATT; an alternative is to park at the parking lot by the NC 751 bridge, put in your kayak in the bay to the east and paddle upstream as far as you can (generally short of Panther Creek because of beaverdams and blowdowns). Tributary D of Northeast Creek: Where does your water go? 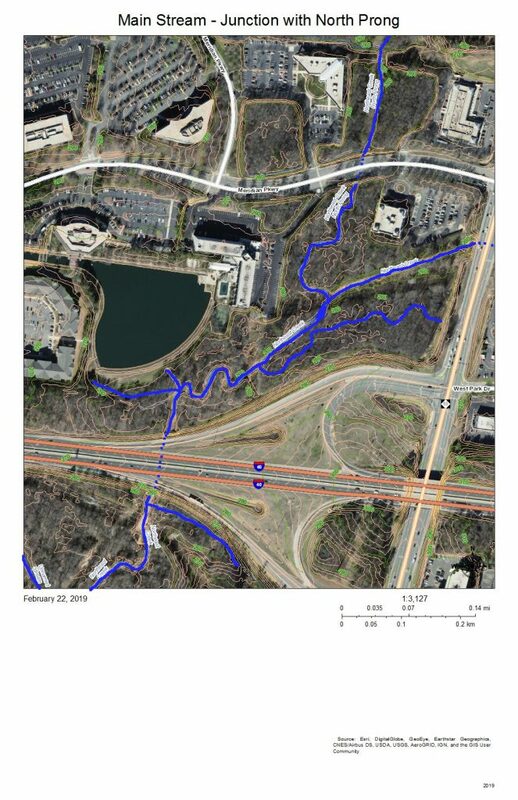 This post presents maps to help find the path that the water takes from the roof of a particular house to Tributary D of Northeast Creek, which feeds the Parkwood Lake. Future posts will look at the main stream of Northeast Creek. On this map, the red line is the boundary with the Crooked Creek basin. The yellow lines mark the sub-basin of the west fork of Tributary D and the dividing ridge along Grandale that separates Tributary D from Tributary C.
Skim through the maps to the part of Tributary D that you want to examine and then click on the map to enlarge. The sections with streams with blue solid or dotted lines are the section of Tributary D that for which the map is a guide, To enlarge further use the + keys in your viewer or Ctrl-+ on the keyboard. There will be some street references in the text following each map. Yellow lines mark the sub-basins of Tributary D. Blue lines are the creeks in the area in the map title. 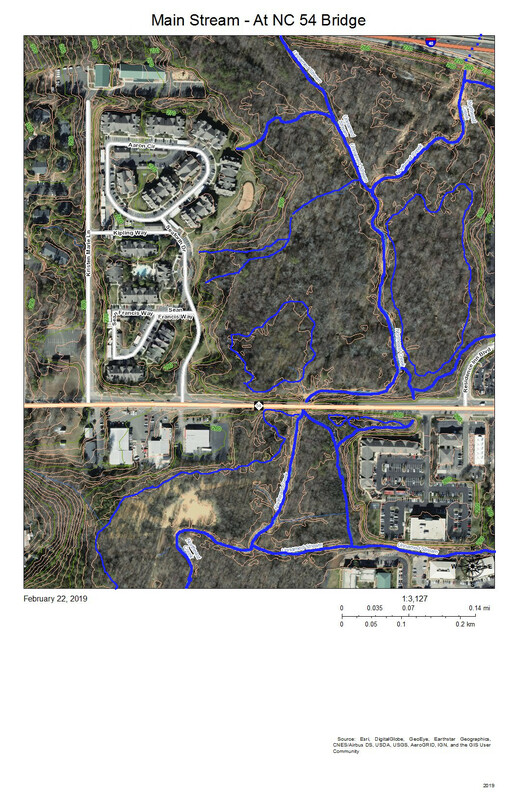 Dotted blue lines are intermittent creeks inferred from the topography or known significant stormwater pipes. The impervious surfaces of roofs are orange within the City of Durham, and the impervious surfaces of parking lots, driveways, and other concrete structures are gray, also within the City of Durham. Outside the City of Durham in Durham County, with the image enlarged enough you can generally understand where roofs, driveways and sidewalks are. Looking from the mouth of Tributary D and Northeast Creek, the sequence of maps examines each upstream branch and the main stream of Tributary D back to its source near the pond in Hunters Woods. Almost all of the section floodway of Tributary D in this map of the map is in US Army Corps of Engineers land surrounding the headwaters of Lake Jordan. This property does extend north of Scott King Road. 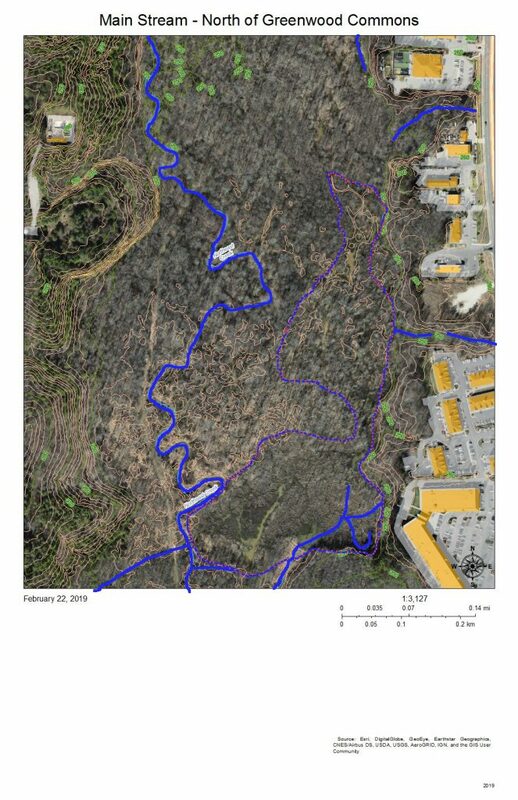 The drainage channels shown on this map are primarily intermittent streams that flow down the swales on either side of Scott King Road and intermittent streams flowing down slopes into Tributary D.
This is an area in which we have cleaned out tires from Corps of Engineers property in past clean-ups. This section of Tributary D is between Lyons Farm on the west and Lake Park on the East. 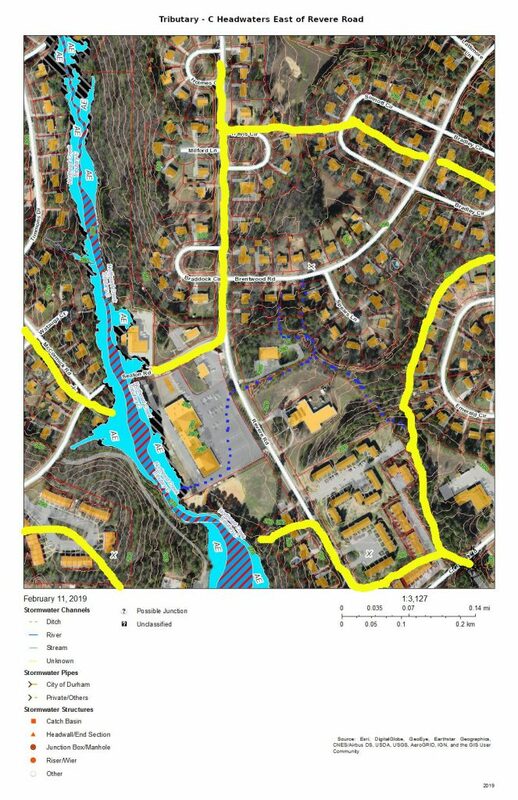 Most of the drainage is from runoff down the slopes, from stormwater pipes not shown on this map, or from the intermittent streams at various points on the stream bank. Fairfield, Grandale, and Lyons Farm are the neighborhoods between Tributary D on the east and a fork of Tributary D on the west that crosses Scott King Road just west of Goldflower Drive and joins the Tributary D wetland in Corps land. Lake Park is the neighborhood on the east bank of Tributary C north of Scott King Road. 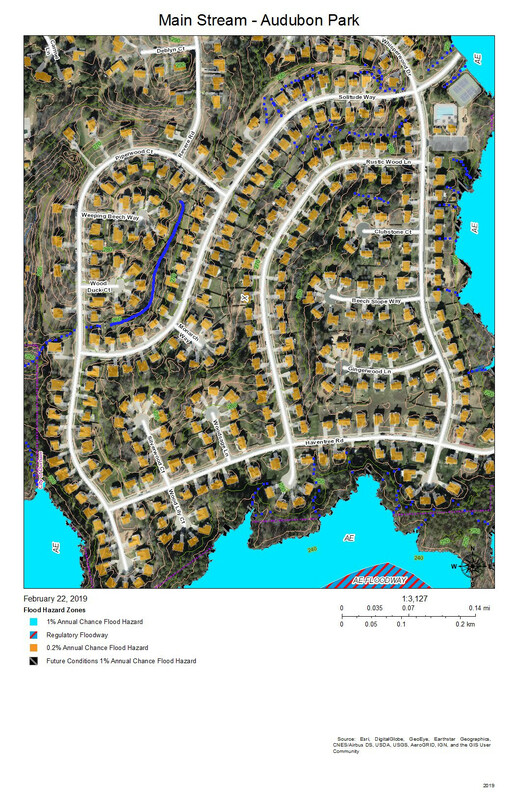 Drainage is from intermittent streams or stormwater pipes not shown on this map. Fairfield, Grandale, and Grandale Place are the neighborhoods where the main stream of Tributary D meets some of its own tributaries. The west bank of Tributary D below the bridge for Lyons Farm Drive. Fairfield and Grandale are the neighborhoods on this section of Tributary D. A tributary stream crosses under Rosemont Parkway just south of the circle on Montibillo Parkway. The yellow line marks the watershed ridge separating the main stream of Tributary D from this tributary. Grandale is the neighborhood in this view, and the neighborhood building at the entrance from Grandale Drive is the one with the L-shaped parking lot. The yellow line along Grandale marks the watershed ridge with Tributary C. The other yellow lines outline the sub-basin of the tributary from Grandover Drive that joins the main stream of Tributary D in this view. Other drainage is from intermittent stream (dotted blue lines) or stormwater pipes not visible on this map. Fairfield and Lakehurst are the neighborhoods in this view. The lake in the Lakehurst neighborhood dams the tributary that flows into Tributary D and that acts somewhat like a retention pond moderating wet and dry weather patterns. 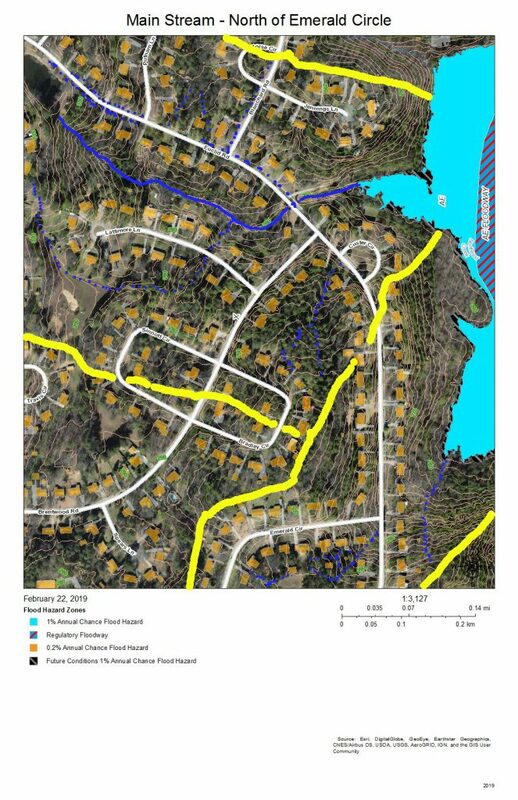 Elsewhere, intermittent streams and stormwater pipes not visible on this map drain the runoff from development into the tributary streams. Grandale Place, Settlers Mill, and the Ridges at Parkwood are the neighborhoods in this view. 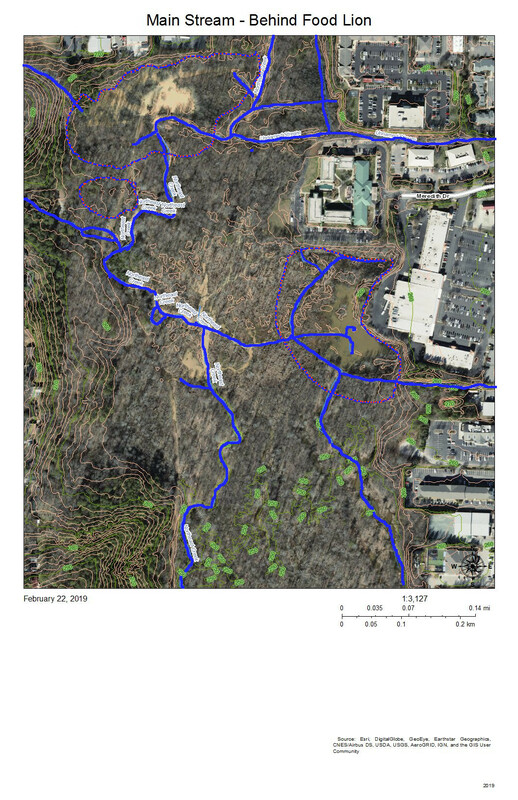 The drainage flows through stormwater pipes not visible on the map and down intermittent streams (marked with blue dots). Grandale Place, Settlers Mill, Grandale Forest, and Lakehurst are the neighborhoods in this view. 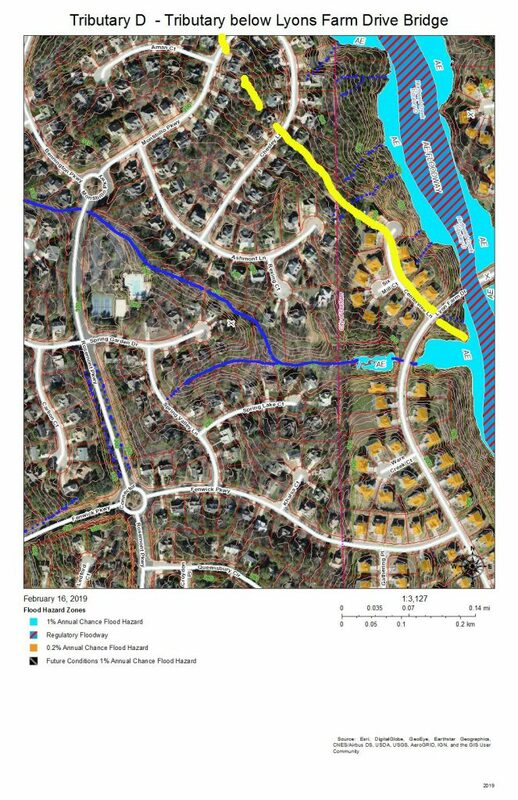 The yellow line at the top is the watershed ridge separating the fork that drains north of Stinhurst Drive from the main stream. 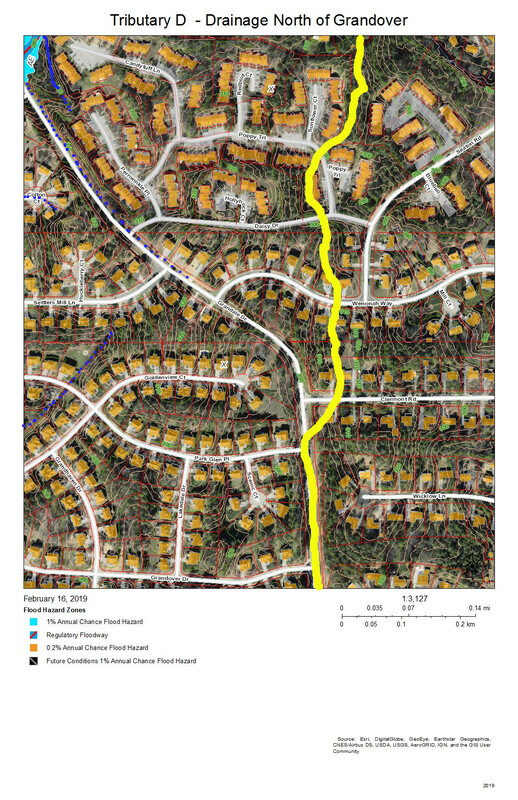 The other yellow line shows the sub-basin of the tributary intermittent streams that drain Grandale Place; this might be supplemented with stormwater pipes not shown on this map. Lakehurst Pointe and Lakehurst are the neighborhoods in this view. The red line shows the watershed ridge between the Northeast Creek basin and the Crooked Creek basin. Two tributaries of Tributary D join the main stream beyond the cul-de-sac at the end of Wineberry Drive. One of these originates above the lake in Lakehurst Pointe; the other originates between the cul-de-sacs of Landreth Court and Middlebury Court in Lakehurst Pointe. Grandale Forest and Parkwood are the neighborhoods in this view. The intersection of Grandale Drive and Wineberry Drive are the point at which a tributary from the southwestern section of McCormick Road, an intermittent creek from the Ridges, and the intermittent creeks that flow down the swales on either side of Grandale Drive merge before crossing through two 4-foot pipes under Grandale Drive and flowing behind the houses on Wineberry Drive. Over 20 years, the section of creek along Wineberry Drive has scoured almost four feet of depth in the streambed, and water still overflows into yards in heavy rains. The Ridges of Parkwood, Parkwood, and Hunters Woods are the neighborhoods in this view. 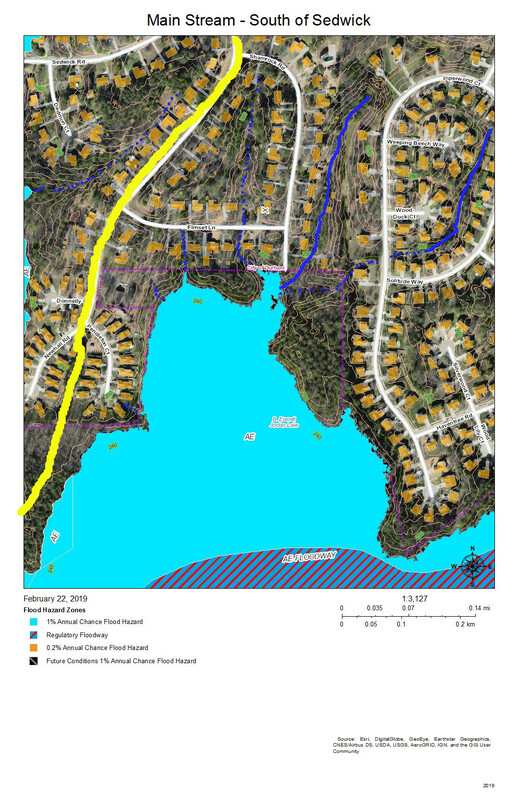 The yellow line marks the watershed ridge between Tributary D and Tributary C. Two tributary streams drain this area–one south of Huntsman Drive and one north of Candytuft Lane. An intermittent stream drains the west side of the McCormick highlands and flows down McCormick Road. Another intermittent stream flows down Limerick Lane. Lakehurst Pointe and Grandin Trace are the neighborhoods in this view. The red line is the boundary between Tributary D and the Crooked Creek basin. The source is in what is soon to be the northwest corner of Grandin Trace and flows into a pond that releases a stream that flows openly and then through stormpipes into the lake in Lakehurst Pointe. Hunters Woods is the neighborhood in this view. The yellow lines on the east are two sub-basins of tributaries of Tributary C that drain the Meadows at Southpoint. The red line is the watershed ridge between Crooked Creek and Northeast Creek. 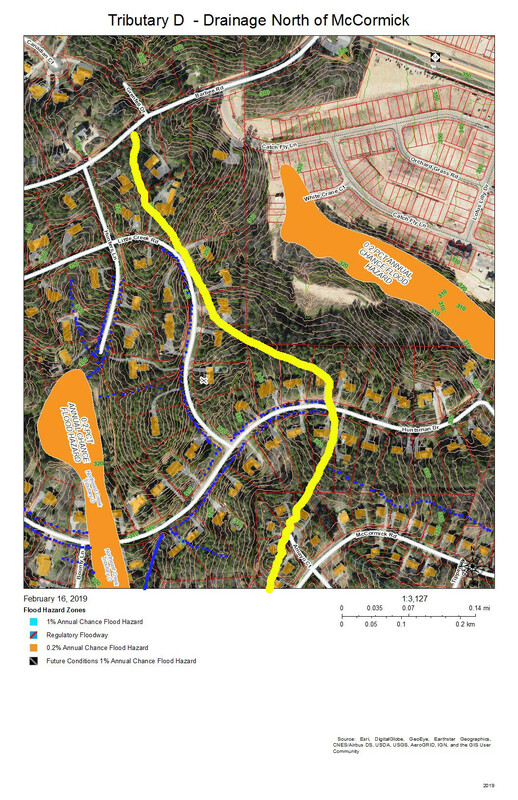 The yellow line along Barbee Road is the drainage off of Barbee Road that road construction has shifted from the Northeast Creek basin to the Crooked Creek basin. A local high point (elevation over 380 feet) was the site of a NC Forest Service fire tower until shortly before Hunters Wood was developed. This high point allow a ranger to see many square miles of woodlands cultivated on the uplands and bottomlands of Northeast Creek and Crooked Creek. Parkwood and Hunters Woods are the neighborhoods in this view. 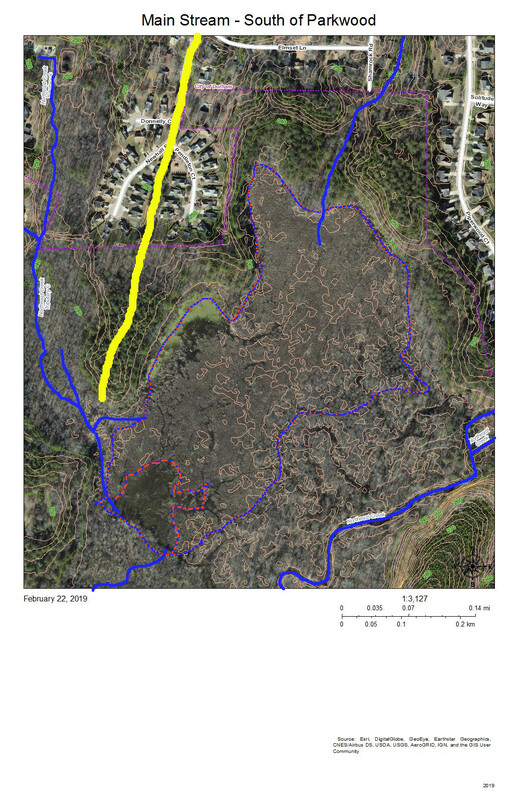 The yellow line marks the watershed ridge between Tributary D and Tributary C. The orange in Tributary C is the 0.2 percent chance flood zone in the headwaters of the Meadows at Southpoint retention pond. 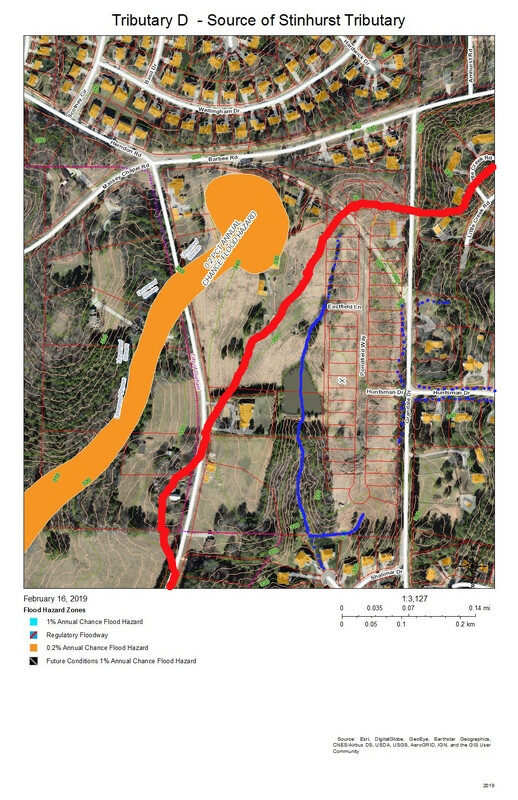 The orange in Tributary D is the Hunters Woods lake and the overflow path if the dam is topped; this is also a 0.2 percent chance flood zone. All of the maps in this series are works in progress that need investigation by residents of the neighborhoods reporting what they see on the ground. There are many points that are not clear from aerial views about how the drainage flows. 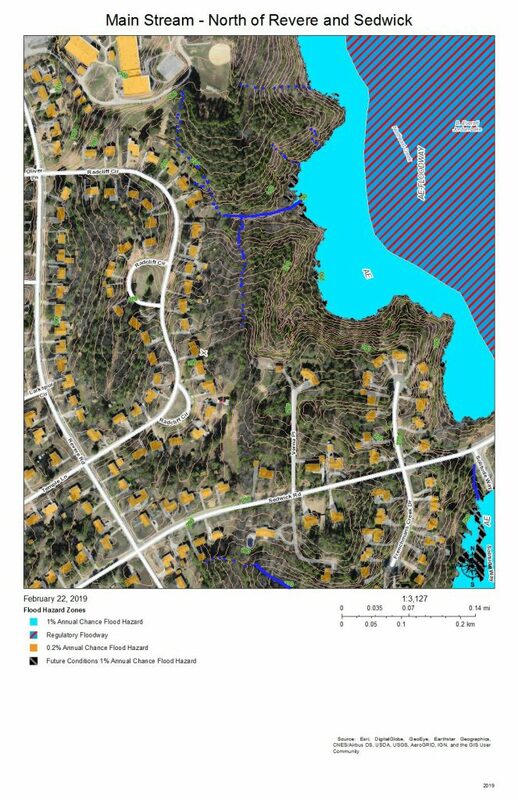 One issue in particular is how the retention pond from Grandin Trace flows into the lake in Lakehurst Pointe. As we get corrections we can edit the maps to apply them and eventually have maps to provide an atlas of the Tributary D basin. 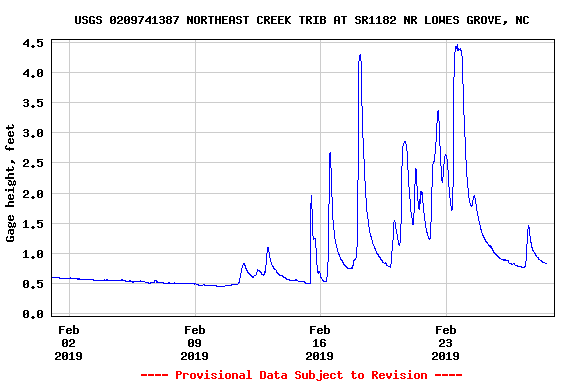 Tributary C of Northeast Creek: Where does your water go? 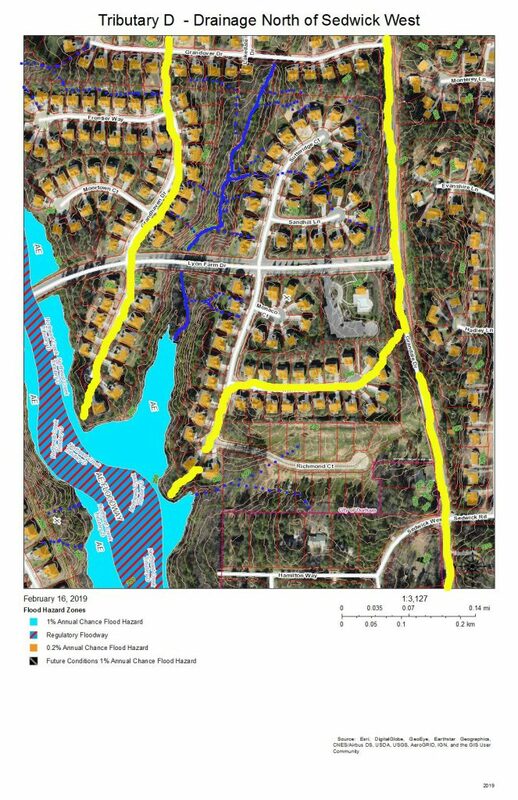 This post presents maps to help find the path that the water takes from the roof of a particular house to Tributary C of Northeast Creek, which feeds the Parkwood Lake. Future posts will look at Tributary D and the main stream of Northeast Creek. Skim through the maps to the part of Tributary C that you want to examine and then click on the map to enlarge. To enlarge further use the + keys in your viewer or Ctrl-+ on the keyboard. There will be some street references in the text following each map. 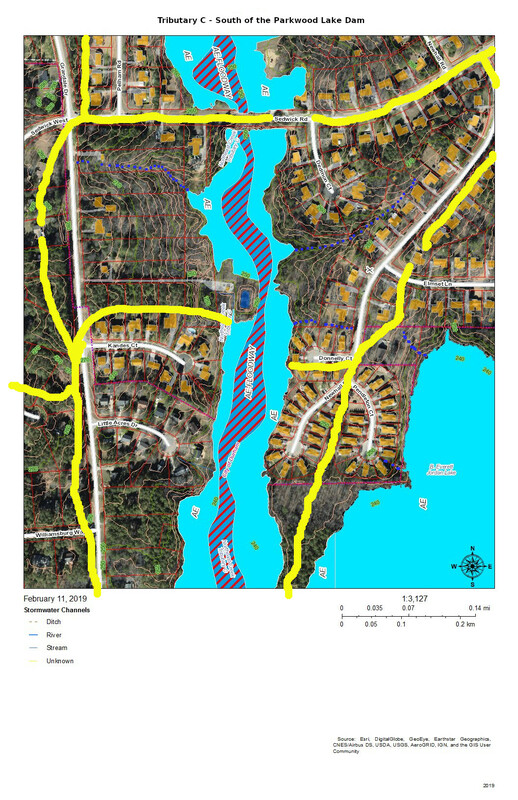 Yellow lines mark the sub-basins of Tributary C. Blue lines are the creeks in the area in the map title. 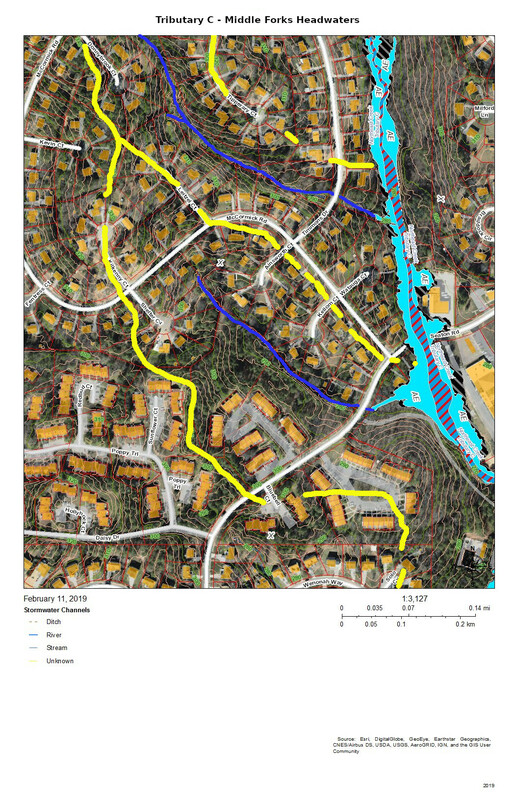 Dotted blue lines are intermittent creeks inferred from the topography or known significant stormwater pipes. The impervious surfaces of roofs are orange, and the impervious surfaces of parking lots, driveways, and other concrete structures are gray. Looking from the mouth of Tributary C and Northeast Creek, the sequence of maps examines each upstream branch and the main stream of Tributary C back to its source near NC 54. The mouth of Tributary C is a wetland flood plain that cycles between swamp forest in drier times and then snags (dead trees that are habitat for wildlife) and freshwater marsh in wetter times. You can see this same sort of landscape on the north side of NC 54 by Woodcroft Shopping Center. Runoff from the roofs and drives flows through the yards or down the streets to the cul-de-sacs and down slopes into the bottomlands. The main stream south of Parkwood Lake comes down the spillways from the lake through woods, under Sedwick Road, and into the bottomlands. An intermittent stream drains the runoff from the houses on Dedmon Court, Donnelly Court, Newhall Road, and Sedwick Road. An intermittent stream on the west side of the bottomlands drains the runoff from two houses on Sedwick Road and one on Grandale Road. 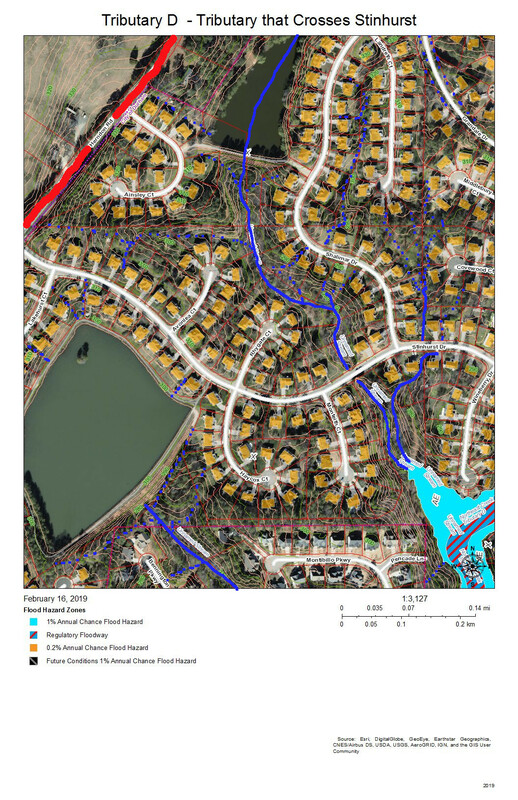 The runoff from the houses on the west side of Parkwood Lake primarily flows down the streets, across Pelham Road and into the lake. The runoff from the houses on lake flows directly into the lake. The runoff from the east side of Grandale Road just north of Sedwick Road is directed into the ditch on the north side of Sedwick Road and is a part of this section of Tributary C.
The east side of Parkwood Lake drains the west side of Revere Road and Larkspur Circle in addition to the houses along Newhall Road and the lakefront houses. There seem to be two more-or-less permanent streams draining from either corner of Larkspur Circle. There is significant Parkwood common land in the center of this block that aids in soaking up rainfall from Larkspur Circle and Revere Road. Another stream drains Temple Lane and Buttonwood Court. 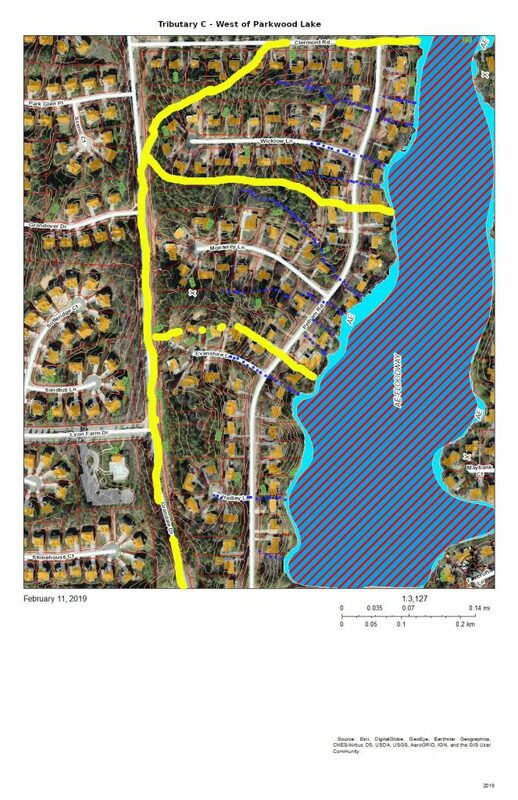 The west fork headwaters drain part of The Ridges of Parkwood, part of Parkwood Village, and some of the houses on Wenonah Way, Runoff from the west fork headwaters flow directly into the Parkwood Lake forebay (former lotus pond). The headwaters of the two middle forks of Tributary C drain the southeast side of the McCormick Road highland. 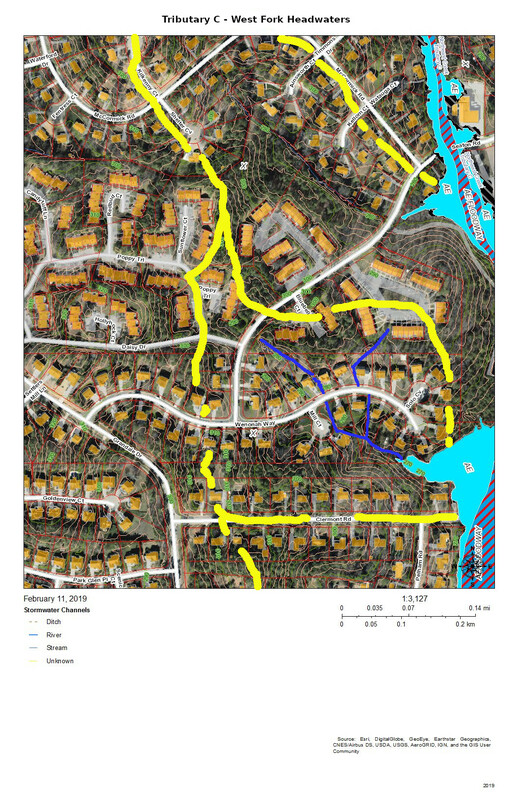 The southernmost of the two middle forks drains most of Parkwood Village. 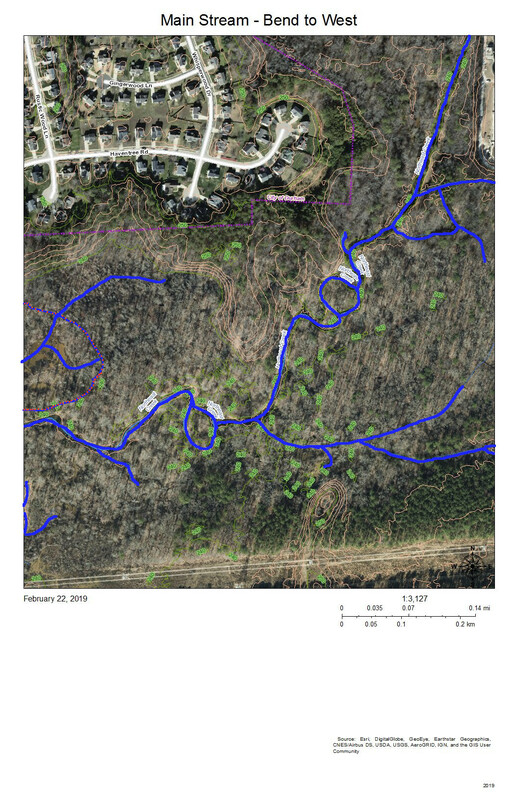 This section of Tributary C shows the main stream in the area of the trail from the Parkwood ballfield to the Parkwood Lake forebay (former lotus pond). The lower section is a significant bottomland that has a variety of interesting native plants such as magnolia, red maple, and native honeysuckle with hearts-a-bustin’, pussytoes, wild oregano, and lyre-leaf sage in the uplands. This elaborate stormwater system is the legacy of the philosophy of controlling stormwater that was prevalent at the beginning of the 1960s — pipe it away. The site preparation for “Parkwood Center”, the commercial and institutional core of the community froze some of the original stream system into the landscape while concentrating the flow under parking lots into a single stream. The object was to dump the excess water as fast as possible into Tributary C. After almost sixty years we can see that that strategy leads to stream scour and transportation of soil down the creek system. And creates erosional undercutting of the stream bank opposite the single stormwater pipe outlet. The headwaters of Tributary C lie completely south of NC 54 because NC 54 was built on a ridge between two tributaries of Northeast Creek and because subsequent engineering of the highway has sharpened the separations of the drainage. 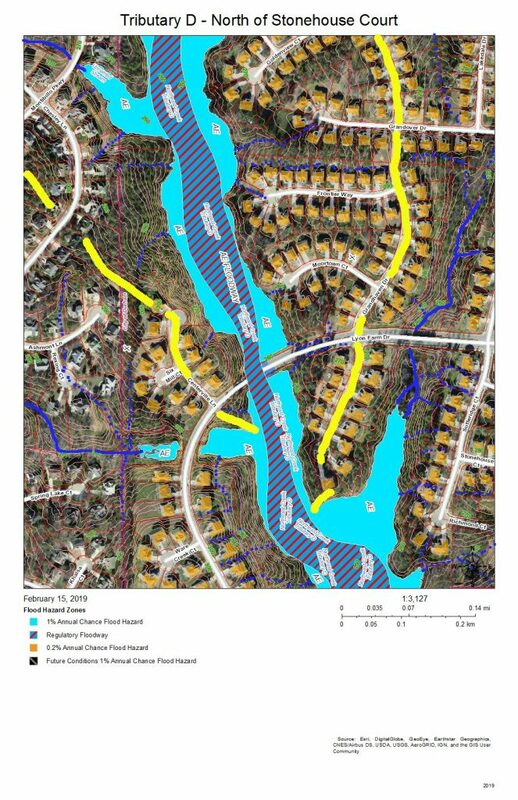 The headwaters now are developed as the Meadows at Southpoint, a town home community that uses regulation-permitted retention ponds instead of open space to manage run-off from its newly constructed houses, driveways, sidewalks, roads, and other impervious surfaces. 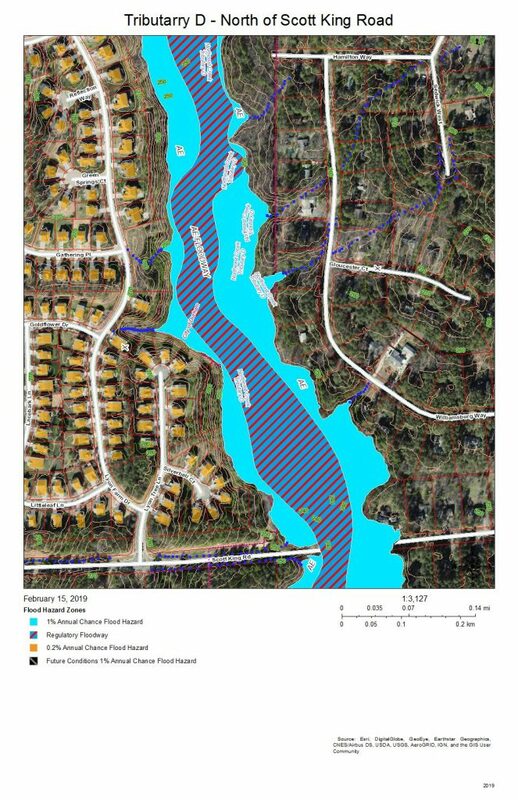 During construction, the Parkwood community experienced the fact that regulations are based on normal patterns of rainfall for construction of retention ponds. When there was a pattern of heavy rainfall, the retention ponds released sediments, particularly colloidial clay, into Tributary C; that turned the Parkwood Lake brown. Residents in the Auburndale Drive-Lamarck Court area were among the first to notice the sediments because they monitor their nearby creeks. In principle, with the completion of construction, the permanent retention ponds will prevent a recurrence. Continued citizen monitoring of their local creeks is the principal way of catching these situations early enough. And this is true for all of the streams draining into Northeast Creek. 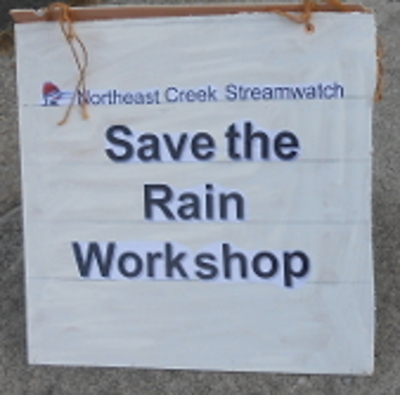 That is why Northeast Creek Streamwatch is encouraging Upstream Neighbors/Downstream Neighbors, a volunteer program of monitoring neighborhood streams and conservation on your own property to harvest rainwater, conserve topsoil, and absorb water during abnormal rainfall. Having attention on the portion of water flow from your house to the nearest creek is a critical part of what gets sent downstream. To do that, we must perceive streams and their tributary flows of runoff in the foreground and land in the background. 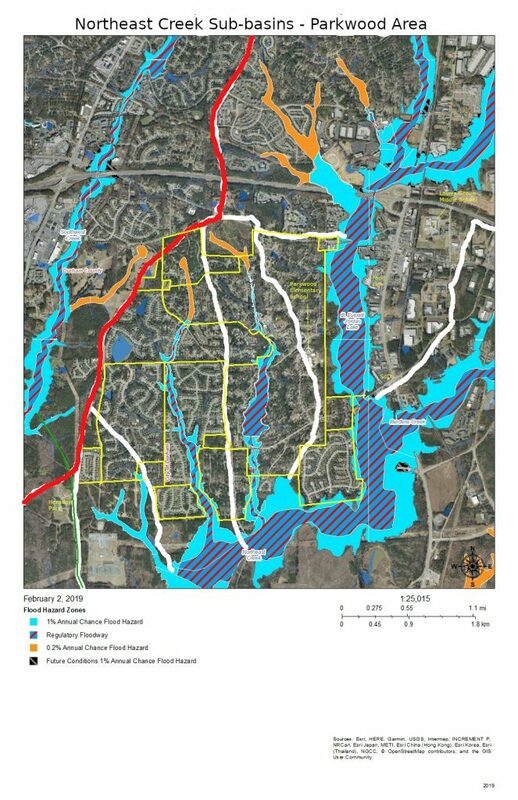 Focusing on the flash flood zones at full flood (the flood zones identified on the Sub-basin map) shows the land as necks extending into the fully flooded lake headwaters. 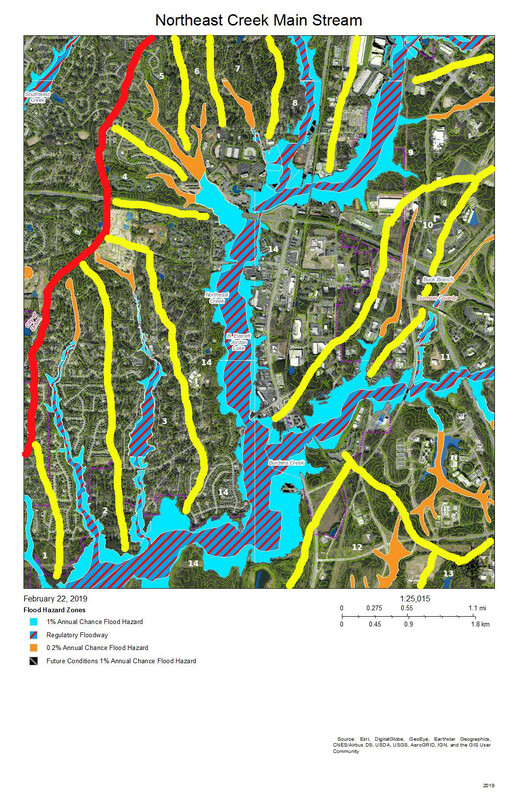 After all, one of the primary purposes of Lake Jordan was mitigation of the flash flooding that often occurred in the Haw River and New Hope Creek basins. To find out which sub-basin you are in, find where your house is on the map. South Durham (SoDu) Farmers Market at Greenwood Commons. Click on the image of the map. Use Ctrl-+ to enlarge the map. Now look for the landmarks. Now trace the path the water takes from your house to the main stream, Tributary C, or Tributary D.
Are any streams by your property? Which sub-basin do they flow into? Where does the runoff from your house enter a stream? Does it flow through a stormwater drain or stormwater pipe? Where does the water drain into a stream? Does it flow down intermittent creeks that only have water when it rains? A fun activity is to put on your rain gear when it rains and follow the water where it flows until you locate the storm drain and stream into which the runoff flows. In February 2006, I and ten others gathered at the Grandale Road bridge over Northeast Creek to do stream monitoring and go on a hike to see spring ephemerals. Michael Pollock had a water sampling kit from City of Durham Stormwater Services, and after we tested samples from the west side of the bridge, led us on a hike. Walking along the Corps of Engineers boundary trail on the south side of Northeast Creek, we saw trout lilies and foamflowers that had just begun blooming. Walking up the natural gas easement back to Grandale Road, we could look northwest across the creek valley to where the gas easement crossed Scott King Road. In April we tested Northeast Creek at an accessible meander just north of Sedwick Road. And then we went for a hike to see the budding trees and the spring flowers. The red maples glowed pink; the oaks were light green; some of the trees had a bluish cast. Stepping along the soggy ground of the sewer easement was challenging, but the world of the Parkwood wetland that we were walking alongside offered more natural beauty to explore. In May, we tested again at the Grandale Road bridge. This hike explored the east side of Grandale Road and up the powerline maintenance access road. Toward the top of that hill, we crossed over to the Northeast Creek stream channel, which we viewed from rock bluffs on the south edge of Parkwood. I was hooked. Northeast Creek Streamwatch was the organization that understood what my wife and myself had seen in 1993 behind the Food Lion store on NC 55. We had seen a wetland with submerged trees and saplings. A great blue heron was perched on one of the saplings; a green heron perched on a slightly larger sapling nearby. That swamp has now become an open pond in flood times, most of the trees drowned. Beavers and property owners have re-engineered the water flow many times over the last 25 years. And I have become committed to preserving our Triassic Basin wetlands, their flora, and fauna for my grandchildren’s grandchildren’s grandchildren to be able to appreciate. • Regular participation in the Parkwood Christmas Parade by puppets of a great blue heron, beavers, an opossum, and frogs. • Spring and fall clean-ups of creeks that result in piles of dumped items for Durham Solid Waste to pick up the next week after Earth Day, Big Sweep or Creek Week. • A class at Parkwood Elementary School about sand, clay, and silt and third graders planting and labeling native plants for a WaterWise garden. • Library programs on the native plants of Northeast Creek and the techniques of rainwater harvesting. • A kayak touring company that did trips up from the mouth of Northeast Creek at the NC 751 bridge almost to Panther Creek in Chatham County. • Hikes along a Jurassic diabase dike formation to the ruins of Sears Mill, an old mill on Panther Creek. • Testing at Northeast Creek crossing of Grandale Road, Sedwick Road, Ellis Road, and in Meridian Center. • An umbrella magnolia by Northeast Creek at Ellis Road bridge. 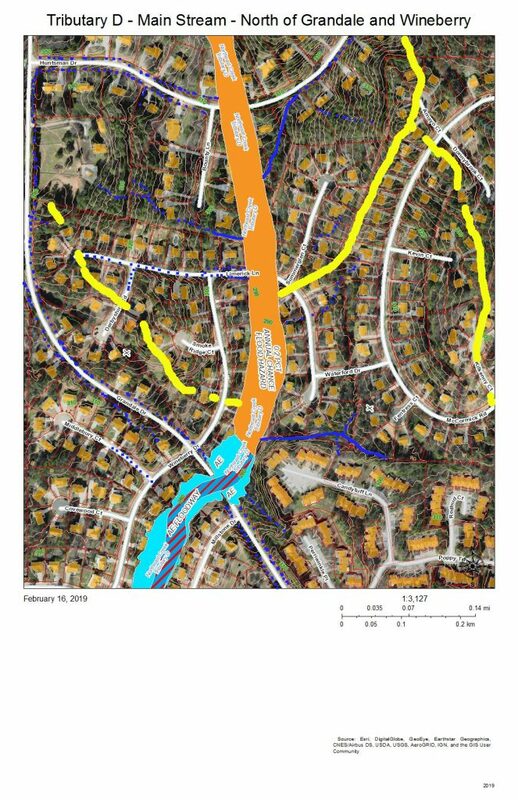 • The descent of a source of Northeast Creek down a steep slope by the Durham Freeway as the creek crosses under the bridge on Glover Road, passes through a steep gully and crosses under the Durham Freeway. • The seep behind an office near NC55 and Riddle Road that is one of the sources of the prong of Northeast Creek that flows just west of NC 55 down to Meridian Park. • The runoff from US70 north of Miami Boulevard that flows through the parking lot of pawn shop and into woods into the back yards of folks on Peyton Avenue, yet another source of Northeast Creek; this tributary flows through Bethesda Park..
• A dump site adjacent to the creek of over 50 years duration that is grown up with red cedars, winged elm, and oodles of vines. • Sandstone caves beneath a bluff supporting leatherwood. • The wetlands at Ellis and So-Hi roads that extend through the RTP properties of major companies and warehouse complexes. • The main stream of Northeast Creek in flood at the NC 54, Sedwick, and Grandale bridges. • A crew from Hillside New Technology cleaning the litter from the blackberry growth next to the NC 54 bridge over Northeast Creek during Big Sweep. • A mother who brought her son from their neighborhood in North Durham to participate in a clean-up of the creek that feeds Parkwood Lake because she wanted to teach him a service ethic. 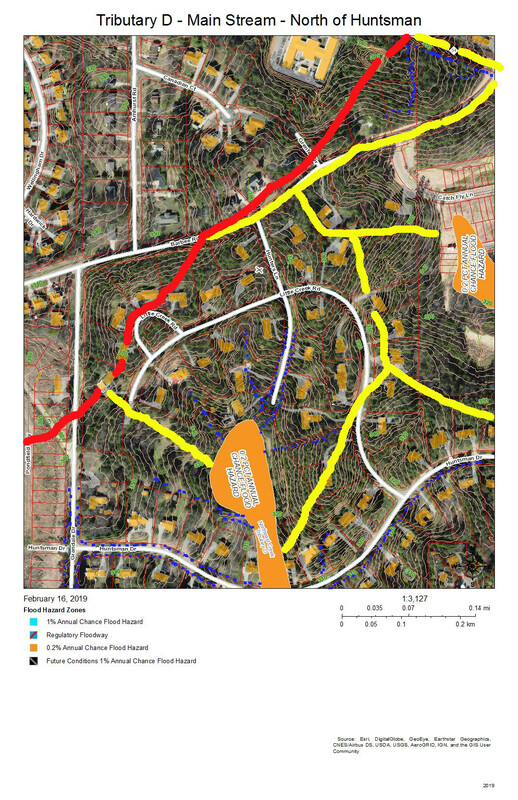 • The awarding of Durham’s Distinguished Tree designation to a white ash in Parkwood and a scarlet oak on the Lowes Grove Middle School property near the creek. • The effects of the 2007 drought at the mouth of Northeast Creek, the appearance of a prairie of grass mat strewn with large mussel shells. • Snow and ice in the Parkwood wetlands in a picturesque meander that Durham Water and Sewer later repaired with a culvert..
• Neighbors and their acquaintances reporting sewer leaks and stormwater issues to us and we getting to see that they are indeed efficiently handled. • The Creek Critters Puppets marching as the Krewe de Creek in the Durham Mardi Gras Parade and promoting the 2016 Durham Creek Week. • The Monarch Caterpillar art project from Fayetteville Street Elementary School at the Monarch Festival along with the students that made it and their parents. • The recognition as Durham Soil and Water Conservation District’s Urban Conservationist of the Year in 2016. 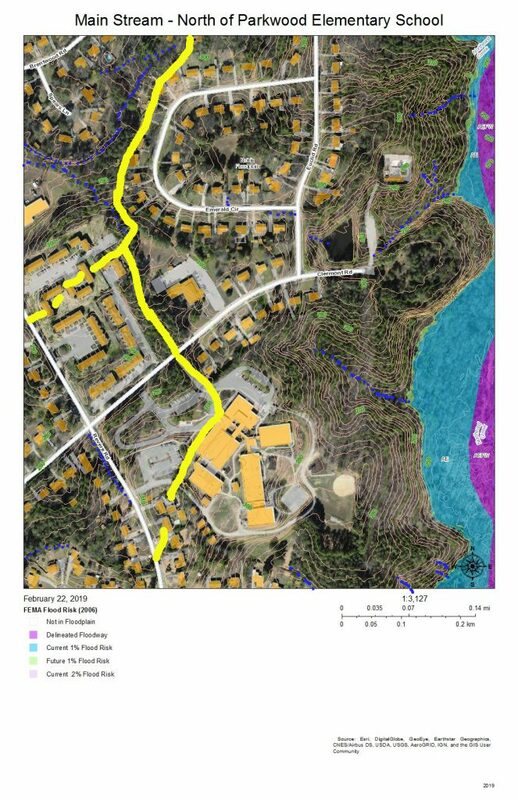 • The support of some 40 volunteers in the construction of Parkwood Village Association’s Wiggly Trail , erosion control, and native plant garden. Completing this project with volunteer labor and donations in-kind to match a $2500 City of Durham neighborhood improvement project grant. • Continued collaboration with Parkwood Village Assocation, Parkwood Homeowners Association, Christus Victor Lutheran Church, Lowes Grove Middle School, Parkwood Elementary School, South Durham Regional Library, South Durham Farmers Market, and local scouts as well as many longstanding individual partners. Upstream Neighbors/Downstream Neighbors – The grassroots network of property owners and residents working on their own to conserve their own part of the Northeast Creek basin. Opportunities and tools to serve them are rainwater retention ideas, planting native plants, removing invasive plants, local creek clean-ups, adopting storm drains, adopting stream segments, adopting highways for cleaning litter. Citizen science activities include Audubon’s Backyard Bird Count, iNature.org, and many others. For additional citizen science opportunities, contact the NC Botanical Garden and the NC Museum of Natural Science. Upstream Neighbors/Downstream Neighbors serves as a network to involve local schools and churches at the local level in local projects, which over the 47 square miles of the Northeast Creek basin means that seemingly small local efforts can result in large results on Lake Jordan’s quality just as small amounts of negligence have added up to a large excess nutrient problem for Lake Jordan. Water Stewardship Network – The supporting network of schools, churches, government agencies, businesses, and voluntary associations that have an impact on Northeast Creek and ally with similar groups in other watersheds. These institutions support individual efforts as part of Upstream Neighbors/Downstream Neighbors. These are the locations of events, demonstration projects like gardens or rainwater treatments, and educational programs. They are Upstream Neighbors/Downstream Neighbors for their own property. Northeast Creek Streamwatch’s water stewardship network can tie into the North Carolina Watershed Stewardship Network (http://wsnet.renci.org/huc_report/index.html?huc=030300020605). 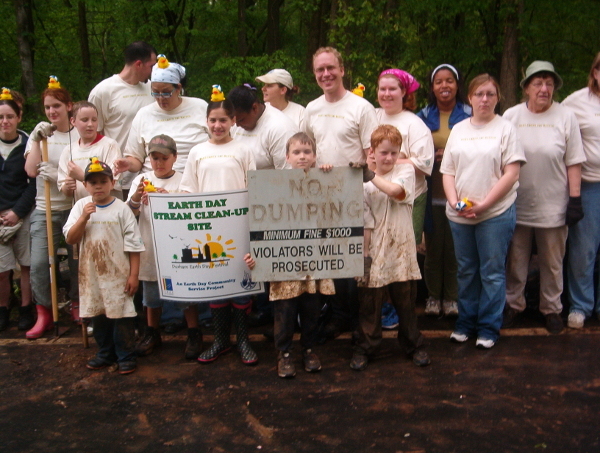 Creek Week and Big Sweep Events – The twice a year momentum builder for local efforts. They get people out into the stream environment and wetlands, show the natural beauty, and get something tangible accomplished with a very short commitment of time. This year’s Creek Week is March 17-23, 2019. Start planning local events for March 15 -23 and notifying colleen@northeastcreek.org. Here are the tips to get spring off to the best of the Northeast Creek watersheed. Watch the arrival and departure of spring ephemerals. 11 Spring Ephemerals Native to Lake Lure and Hickory Nut Gorge Lake Lure is in the mountains of Rutherford County, NC, between Rutherfordton and Asheville. How many of these same spring ephemeral flowers show up in the wetlands and uplands of the Northeast Creek basin some 220 miles along I-40? Check out the James Pullman Photos and the David Carter Photos on this site to get some clues to where they typically appear. Identify the erosion and drainage issues to address in your yard this year. Durham Soil and Water District: Community Conservation Assistance Program A key partner in Northeast Creek Streamwatch’s Upsteam Neighbors/Downstream Neighbors watershed improvement program using individual porperty-owner initiatives. Gather your neighbors to walk and clean your roadway of litter. For more information contact colleen@northeastcreek.org. For the second year, Cory Quammen, a resident of Grandale Forest on the headwaters of “Tributary D” of Northeast Creek, is holding a gathering of his upstream and downstream neighbors, Saturday, October 22, 9am – 11am to show some examples of problems caused by excessive runoff as well as some rain-saving measures that have been installed on his property.. Invitations will go to the neighbors within his local creek basin in advance of the meeting. Contact cquammen@gmail.com for further information. 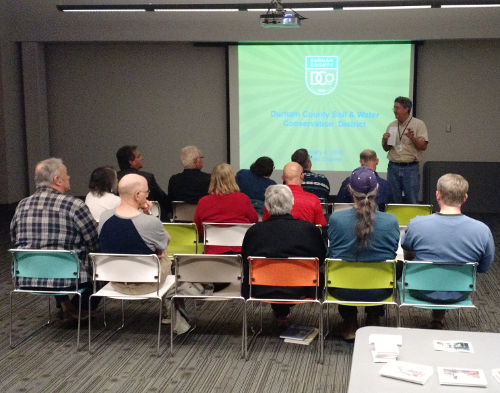 The Upstream Neighbors/ Downstream Neighbors project hosted Mike Dupree of the Durham County Soil and Water Conservation District at the South Regional Library on February 4. Mike informed us about the services that his department of county government provides to property owners and why these services benefit both the property owners and the quality of water—specifically in Northeast Creek and in Jordan Lake. In introducing Mike, Cory Quammen shared how the Durham Soil and Water Conservation District is helping owners of property that backs up on a creek in his neighborhood with flooding and stormwater issues. Mike will be speaking at the Eno River Unitarian/Universalist Fellowship (ERUUF) on Wednesday, February 24 at 7:00 pm. His topic will be managing water, nutrients, and pests. Thanks to everyone who came to the South Regional Library. We would love to hear feedback from those of you (5) who set appointments for Mike to consult with you about the issues with your property. Send your comments to colleen_haithcock@yahoo.com. For those who wish contact Mike Dupree, it is mdupree@dconc.gov or 919-560-0558. Here is a link to a video about the Voluntary Nutrient Reduction Program that Mike Dupree described February 4.